Biogeographic Regions: What Are They and What Can They Tell Us? Every species in the world has a unique geographic distribution. But many species have similar ranges. There are many things that can cause two (or more) species to have similar ranges – for example shared evolutionary histories, physical obstacles (mountains, oceans etc.) or ecological barriers limiting their dispersal. As a consequence, different regions of the globe are inhabited by different sets of living organisms. In the mid-19th century ecologists recognised that the earth could be divided into different biogeographic regions. Alfred Russel Wallace (1823–1913) played a key role in defining and recognising biogeographic regions. He improved the existing maps of biogeographic regions and provided basic rules to identify them. His observation that some of these regions are home to similar species, despite being far away from each other and separated by significant barriers was the inspiration for Alfred Wegener’s theory of continental drift. In more recent years regionalisation has been used to understand the spatial drivers of biological evolution and to protect those regions characterised by particularly unique flora and fauna. Despite the long history of biological regionalisation, the methods to identify biogeographic regions are still being improved. We are currently working in this exciting field of research and recently published ‘A new procedure for extrapolating turnover regionalization at mid-small spatial scales, tested on British butterflies’ in Methods in Ecology and Evolution. How to Recognise and Define Biogeographic Regions? Although this definition describes what biogeographic regions should be it doesn’t explain how to identify them or give us objective procedures to do so. In recent years many methods have been proposed to identify biogeographic regions and new algorithms to help with this are appearing all the time. In 2010, Holger Kreft and Walter Jetz published a seminal paper in which they proposed the use of occurrence data obtained at some spatial scale (e.g. squares units of 100 x 100 km2) applying to this a beta-diversity index to compute a dissimilarity matrix among the square units based on species occurrence. In their paper, they used the Simpson turnover dissimilarity index – as it is not dependent on species richness – and applied a combination of hierarchical clustering and two dimensional ordination to it. The first approach identifies coherent groups of areas, the second gives colours to depict the distinct regions on the maps. The more similar the colours on the map, the more closely related the flora and fauna of the region. The recent paper by by Holt et al. – “An Update of Wallace’s Zoogeographic Regions of the World” – is a great example of the Kreft and Jetz procedure. Wallace realised that the organisation of biogeographic regions has to be hierarchical and that large regions can be divided in sub-regions. Accordingly, he identified four different sub-regions for each of the six main regions (see the map above). In theory, this fragmentation process could proceed until each square unit represents an individual sub-region. In practice though, regionalisation at smaller scale is a difficult matter. When spatial units are close to one another and not separated by conspicuous barriers (like sea straits or mountain chains) the differences in fauna and flora tend to be subtle and many spatial units have identical values of the Simpson dissimilarity index. The existence of many tied values (especially when equal to zero, meaning that there is no species replacement between two areas) affects our ability to create dendrograms and generates a lot of equivalent and different clustering solutions for the same dissimilarity matrix. Often equivalent solutions are significantly different from one another and in practice render the use of any single solution based on these algorithms for hierarchical clustering unreliable. The regionalisation results obtained by applying the Kreft and Jetz method to the British butterfly data by applying three different clustering algorithms to the Simpson dissimilarity matrix among 10 x 10 km2 squares (Unweighted Pair Group Method with Arithmetic Mean, UPGMA; Complete linkage and Partitioning Around Medoids, PAM). In ‘A new procedure for extrapolating turnover regionalization at mid-small spatial scales, tested on British butterflies’ we verified the existence of such potential bias by applying the Kreft and Jetz method to one of the most complete faunistic datasets available: the occurrence of butterflies in Britain between 2000 and 2009 for squares of 10 x 10km. As expected, the application of the regionalisation procedure to this dataset resulted in different solutions for each method. Most of them failed to disclose any real partition between the squares or revealed completely incoherent (not spatially structured) patterns. Recluster is an R package that provides the functions needed to carry out the Kreft and Jetz procedure. It uses robust clustering methods and allows users to obtain reliable regionalisation solutions at medium-small scales. The main problem of hierarchical clustering when there are low levels of diversity, and many tied values in a dissimilarity matrix, is the possibility for multiple (grouping) solutions. Recluster computes a number of such equivalent dendrograms for a given dissimilarity matrix and then calculates a consensus tree by using different algorithms. One of these algorithms has been specifically created to group communities belonging to geographic units at medium-small scales and it has been tested on the same dataset of British butterflies. It clearly separated the communities of British butterflies into three different clusters with a clear geographic pattern. The distribution of the three regions corresponds to different geo-morphological and climatic zones of Britain and is characterised by a restricted set of typical butterfly species. Since the observed pattern corresponds closely to areas characterised by different climates (North vs South) and different impact of human activities (South-West vs South-East), we would expect any environmental modification to change the regionalisation pattern over time. Our algorithm can detect changes in composition at the overall community level, highlight the direction of such changes (which biogeographic regions are expanding or contracting) and, by using different diversity indexes, unravel which components of diversity have improved or deteriorated (e.g. local richness or species replacement). There are many potential applications of regionalisation in ecology, particularly in the conservation of diversity. The increasing availability of occurrence data, including citizen science data, will expand the possibilities of this exciting field of research. 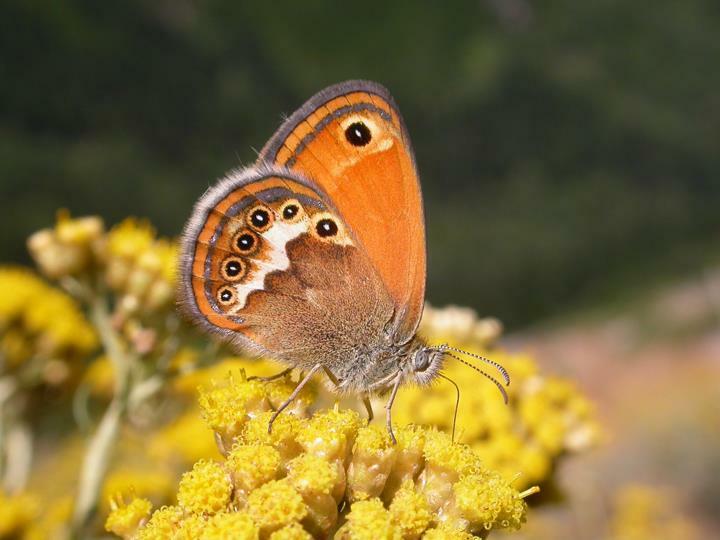 To find out more about biogeographic regions, read our Methods in Ecology and Evolution article ‘A new procedure for extrapolating turnover regionalization at mid-small spatial scales, tested on British butterflies‘. This article is part of our Novel Ecosystems in the Anthropocene Virtual Issue. All articles in this Virtual Issue are freely available for a limited time. This entry was posted in Methods papers, Virtual Issues and tagged biodiversity, Biogeographic Regions, Biological Regionalisation, Butterfly, conservation, ecology, ESA 2016, Novel Ecosystems in the Anthropocene, R, Recluster, Simpson Dissimilarity Index, Species Distribution by Chris Grieves. Bookmark the permalink.